I never thought much of drill presses. Not out of any particular disdain for them, but I never saw the need to buy one. Until, as a hobby, I tried to repair some old heirloom furniture (tables missing legs, rocking chairs with broken spindles, that sort of thing) and quickly learned the error of my ways. If you ever want to know what true frustration feels like, try drilling properly spaced, sized, and placed holes in something without help and without the proper equipment. It is truly painful. So I finally broke down and shelled out for a drill press. I won’t lie to you and say it’s something I use all the time: I’m a hobbyist, after all. But it’s a useful tool to own, and even a small and cheap one can make your life a whole lot easier if you like working with wood (or metal). Before I bought one, I had to do a lot of research to figure out what best suited my needs. Hopefully I can help you save some of that research time. If you’re really in a rush, I’ll list some of the best options just below, but stick around a bit longer and I’ll explain the how and why I made the choices I did so you can be informed in the future. So What Is a Drill Press Anyway? Basically, it’s a big table with a clamp and a drill attached. It sounds simple, and it is, but it’s incredibly important for doing any kind of precision drilling. There are some things you can’t do with just your hands, a flat surface, and a power drill. Something that holds a cumbersome piece of wood or metal still and puts the holes exactly where you need them is an invaluable tool. Benchtop Drill Presses are smaller, cheaper, and weaker than Floor Model Drill Presses, which are larger, more powerful, and more expensive. For a hobbyist like myself, a Benchtop model is far more preferable, as I can more easily store it and it wasn’t a huge upfront cost. The overall lower power and smaller usable space isn’t really a factor for what I need it for. However, if you need something more heavy duty for large projects (and you have space), consider getting a floor model. If you need the extra power and room, then you really need it. It’s kind of like the general rule for doing any kind of cutting: you can always cut more, but you can never cut less than you already have. Except, in this case, you can always use a floor model for smaller jobs, but can’t really use a benchtop model for larger ones. If you ever think you’re going to need that extra space, get the floor model. Otherwise, a benchtop will do you just fine. As a wise man once said: “More power”. When looking into buying a drill press, note its horsepower. More is usually better, as long as you can afford it. Similar to space, a powerful drill can be turned to a less powerful setting, but a less powerful drill will never be capable of doing those heavy duty jobs. Keep in mind that drill presses run on electricity and while this isn’t usually an issue take care to make sure its power draw isn’t more than your electrical system can handle. Measured in RPMs, you want an adjustable speed more than a high one. Different jobs call for different drill rotations, and a drill that goes on full blast the whole time is almost useless. Usually, a higher horsepower also means a higher maximum RPM, but the reverse is not always true. Many (I’d even say most) drill presses on the market can hit 3100 RPM, and even some relatively higher horsepower models max out at that amount. The difference usually comes in its combination with the stroke (which I’ll explain below) or the material: a longer stroke might mean the same or lower RPM can still translate into a longer hole, and harder materials take more power to drill through at any given speed. Basically, just because the max RPM is the same with a higher horsepower, doesn’t mean the drill is worse. It may just mean it uses that higher horsepower to drill deeper at the same RPM or keep the same RPM while drilling into harder materials (like hardwoods, metals, ceramics, and plastics). This is one of the simpler, but more important features. After all, you’re likely going to be drilling into curved wood, or need some kind of tilt. Strong clamps and a greater capacity for incline are important things to look for. I’m never a fan of having a tool that only does one thing, particularly if it’s a niche function like drilling. Thankfully, drill presses are often able to swap attachments, so you can turn it into a sander or mortising machine (a kind of chiseler), among other things. Stroke is basically “How deep a hole can this drill press do?”. For the vast majority of these drill presses, the answer is going to be “3 and ¼”, as that seems to be the most common number. Assume each drill press has a 3 and ¼” stroke unless I specifically mention it, as there are very few outliers in this regard. A stopper. This will prevent you from drilling too deep into whatever you’re drilling. An iron “head”. While not the only workable material, it is the best. It is a strong and heavy material, which helps shield, support, and steady the drill bit. A chuck which tightens via a key, to make sure it stays tight. The chuck is the part that holds the drill bit into the part that spins. A loose one is frustrating to use and potentially dangerous; the bit can come loose and (at higher speeds) potentially go flying off in some random direction. One of my hand drills has a loose chuck. It’s nearly worthless as a result. Unlike many things, a heavier drill press is much better than a lighter one. The heavier the press is (particularly at the base, but everywhere else as well) the less it will vibrate and rattle, and the steadier work you’ll get out of it. A light drill press is harder to use for no benefit. They’re not made to be especially portable for good reason. While the prices for all models range from extremely low to exorbitantly high (from $50 to $50,000), we’ll be mostly looking at the range of $100 to $1500, with a few outliers. Bench top models tend to range from about $50 to about $500, while floor models run from around $350 to $1200 on average. The extremely expensive industrial models are entirely different beasts, and will not be discussed. Now, with that out of the way, let’s look at some drill presses! This is a good (and very cheap) option. This drill press has a lot of what we’re looking for in a benchtop drill press. It has a decent sized space to work with (16 to 29 inches in height), is adjustable in 15-degree increments (up to 90 degrees), and does have a depth stop. It also comes with a few nice quality of life additions, such as a “crow’s nest” for storing your drill bits and built-in cord storage. The downsides, however, are that it is very light (only 26 lbs) and its horsepower isn’t much to talk about. This means it’s fairly weak and has a tendency to wobble: two things I specifically pointed out as being undesirable. However, I feel that for the price these drawbacks can be forgiven. It’s under $50, making it easily one of the cheapest drill presses on the market, and is still a good tool for many peoples’ uses. Avoid for any heavy duty work, but if you just need a cheap drill press for small projects, the downsides can be ignored or worked around (by clamping the press itself to the tabletop more firmly, for example). A big jump up in quality here. While definitely not the most powerful drill press on the planet, this one makes a great intro tool for the DIYer and wood or metal working for hobby crowd. It boasts 2/3 horsepower and extreme precision, with an X laser guide painting exactly where the drill is going to go, and a beveled work table. The worktable can shift up to 45 degrees to the left or right (with precise measurements on either side, accurate to the degree), which is a great help for those awkward holes that need drilling, or for curved pieces. The precision capabilities mount, as it also has an adjustable depth gauge, acting as a stopper: you simply set it to how deep you want to drill, and it will stop there. It has a cast iron base and weighs a little over 50 lbs, so you don’t have to worry about it wobbling too much. The keyed chuck means it’s going to grip your drill bits tight and not let go, which is good because its 5-speed motor goes pretty high (it starts at 600 RPM, and can be adjusted to run at 1100 RPM, 1700 RPM, 2400 RPM, or 3100 RPM). I find nothing worth mentioning to complain about with this one, not even the price. You can get it for under $150, which is great for a tool as reliable as this. It’s not a showstopper, but it’s really good. Similar, but subtly different than our previous entry. This one has a bit less horsepower than the Wen 4210 (1/2 HP vs 2/3 HP), but not to a degree it hurts much of anything. This results in an ever so slightly lower minimum RPM (570 RPM vs 600 RPM) and almost, but not quite, the same maximum (3050 RPM vs 3100 RPM). This means the performance in that regard is almost exactly the same. It likewise has an X laser guide for precision, and can tilt its work table to 45 degrees left or right, as well as a similar 52 lb weight, keyed chuck, and adjustable depth stop. Even its price is roughly the same. The main differences are in safety features, one for the user (it’s controlled by a bump switch, allowing for rapid shutoff in case things go awry) and one for the product (a 3-year manufacturer’s warranty). Given these two things and everything else being about the same, I find this one to be the better choice. The bigger, stronger brother of the Wen 4210. Just about everything about it is bigger and better than the 4210. 5 speeds? Nice, but this bad boy can target any particular speed between 580 RPM and 3200 RPM, with a LED readout to tell you the exact speed at the moment. A 1/2 inch chuck? Meet 5/8 inch, able to take on larger bits. Even the workspace is bigger, being 9 and ½ inches on either side (as opposed to 7 and 5/8 inches for the others on this list so far), and it has a pull out the roller to extend it another 17 inches if you need it. As you might expect from the overall larger machine, it also weighs 89 lbs too, about 50% heavier than the 4210, giving it even more stability. Everything else you might have liked about the 4210 is here as well, from the laser to the overhead work light…the only thing missing is the price. While not exorbitant, this one WILL run you about $100 more than the 4210, though that’s a sacrifice I feel is well worth it. This is one of the bigger, badder benchtop models out there, and the best of the bunch. It has the highest variation in available speed: all the way down to 250 RPM and up to 3050 RPM. The extra horsepower (3/4 HP) largely goes into making sure it can maintain that 3050 RPM even when drilling through tough or thick (or both) materials. It has the largest workspace of the bench top models we’ve looked at, a 12 and ¾ inch diameter circle. Its vertical space is also the largest we’ve seen, as its table tilts a full 90 degrees to either side: allowing you to use the base itself as a table instead and fit larger pieces in. While it lacks most of the bells and whistles of other models we’ve looked at (like laser precision, LED readouts, “crow’s nests”, and other such things) it has the highest raw performance, which is mostly what I’m concerned within a power tool. This makes the Shop Fox W1668, in my opinion, the best benchtop model around with one caveat: it fits what you’re willing to pay. At a bit over $400, it’s nearly double the price of the Wen 4214, which is in itself a great piece of machinery. While the Shop Fox is unequivocally better, it may be hard for some to justify the price, particularly as an entry-level model. Consider this your baseline for floor model presses. It has about average stats in every regard. A relatively standard 1 horsepower, a 5/8 inch chuck an 11 and 3/8 inch square work table, 340 to 2860 RPM and an included overhead light. It weighs 165 lbs…which is actually a little bit on the low end for a floor model, so be aware of that. While this one won’t blow your socks off, it’s still a good, relatively cheap (around $400, the low end for a floor model drill press) drill press that will get the job done for you. If you’re a hobbyist on a budget, and you have space, this isn’t a purchase you’ll regret, though if you have a higher budget, there are better drill presses to spend your money on in both categories. Better in nearly every way. While it has a lower horsepower than the Klutch (3/4 HP), it has a better range of RPM (250 RPM to 3050 RPM) on a 12-speed setting. The table is a 12 and 3/8 inch diameter circle, and similar to the bench top W1668 can rotate up to 90 degrees left or right, effectively increasing your usable area for large pieces. Perhaps even better, it is easily converted to a sander and has an oscillating spindle to make it even better at that job than a normally converted drill press. The extra weight (180 lbs) and 2-year manufacturer’s warranty are the icings on the cake. If you have an extra $100 to spend, definitely choose this over the Klutch for the improved sanding function alone. This is a great machine with a few small issues. It has much to be desired in its power and precision, but a couple of minor flaws that may hold it back. It’s a ¾ horsepower drill press with a huge 16-speed variable range (from 200 RPM to 3630 RPM, the highest we’ve seen so far). It has the precision depth stop and 45-degree tilt that is mostly standard, along with a pretty solid cast iron and steel construction. The table is satisfyingly large (11 x 19 and ½ inches) and can hold up to 44 lbs of weight. The only issue is the weight of the machine itself, a fairly light 167 lbs (odd, given it has a cast iron head and steel body). Given the power of the machine, this is just a little too light, though could be offset by the heavy weight you can put on the table. Another small problem is the table size. It’s much wider than it is long, making it awkward for some projects. In my experience, I usually have more issue with using long pieces of wood than wide ones, which would make this less desirable for my purposes. Still, even given those minor gripes, it’s a great drill press, and still within a reasonable price range of under $700. An even bigger, even better Wen. The claim to fame for this one is its extra long stroke. While the power (280 RPm to 3300 RPM) is nothing to sneeze at, and everything else we’ve come to expect from Wen is still there (X laser guide, workshop light, large 12 inch square worktable, etc.) the 4 and ¾ inch stroke/spindle travel is the really unique feature. As mentioned above, 3 and ¼ inch is the usual average for stroke, making this able to drill much deeper holes on a single pass than most other drill presses. That shouldn’t be underestimated on big projects: it’s a huge time saver to not have to pull up and come back in. 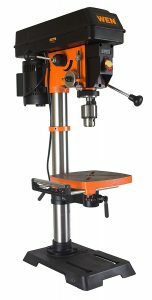 You can’t even really complain about the price: around $650 is not bad for the kind of power and precision this drill press can provide. Another Jet, but this time without the problems. This machine is the most powerful we’ve looked at today. It’s a bit of a monster: 1.5 horsepower and a range from 150 RPM to 4200 RPM (a much larger range than before). It boasts being able to drill through 1 inch of cast iron, or ¾ inches of mild steel with ease. Like the Wen, it has 4 and ¾ inches of stroke/spindle travel as well, handily beating it out there. Even my two gripes from the Jet 2500 are gone: It weighs 325 lbs (it’s not moving once you get it sat down) and has an 18 and ½ inch by 16-inch table, fixing the odd “much wider than it is long” issue I had with 2500. The only issue is the price: around $1000, but even that can be forgiven for how much power it brings to the table. This section is going to work a little differently. Most of these drill presses are going to be ones we’ve already talked about; you already know the specs. Instead, I’m going to be giving you a breakdown of the best drill presses in certain categories: Woodworking, Metalworking, the best small drill press, the best radial drill press, the best magnetic drill press, best drill presses by Brand, and best drill presses for certain price ranges. With the exception of the radial and magnetic drill press categories, and some of the brands, the majority of entries in each category will have already appeared on this list and I’m instead going to give a breakdown of WHY they’re great for this certain category (or categories for ones that are the best for multiple things). For items we haven’t yet talked about I’ll give a quick breakdown of their stats and pricing as usual in addition to the why and how they’re great for a specific purpose. That out of the way, let’s begin! My picks for this category are three familiar faces: the Wen 4214, the Skil 3320-01, and the Wen 4227. All three are good for what they do, and generally, I feel a bench top model is enough for most woodworking projects. The Wen 4227 is here for the occasions it’s not. All three boast power and precision sufficient for most woodworking jobs, the benchtop models able to power through most types of wood to a reasonable thickness with ease, and with a bit of effort for the tougher jobs. The Wen 4227 on the other hand, is there for the really big jobs. The longer stroke makes it perfect for drilling through hard, thick chunks of wood like oak or maple and the power can’t be argued with. While any drill press is a good choice for woodworking, it’s hard to argue any other of the three on this list being better than one of these three for the combination of price, power, and precision they provide. The laser cutting guide on all three alone makes them worth it, as utterly ruining a piece of wood is far easier than ruining a sheet of metal. Drilling in the wrong place on wood not only leaves you with a useless hole but can crack the entire length of the wood if you hit the exact right (or wrong, in this case) part of the grain. For that reason, these three receive my woodworking seal of approval. For metalworking, I value power and usable area a bit more. Precision is still monumentally important, of course, but it takes a little extra to power through metal than it does to get through even most hardwoods. The Wen 4227, Jet 354170/JDP-20MF, and Jet 2500 have this power. While I did complain a little bit about the Jet 2500’s lack of weight and weird table dimensions, it’s still a great machine, and its weight problems mostly disappear once you’ve weighed down the machine even more with whatever happens to be on the table. Still, its show is admittedly stolen by the power couple of the 4227 and Jet 354170/JDP-20MF. Both vastly outperform it in every way. Still, the three together provide an excellent price spectrum of good metalworking tools. The Jet 2500 may be weaker, but its performance is still admirable and easily made up for by the cheap price. The Wen 4227 is a little more expensive, but provides far more precision and utility (being able to easily drill both wood and metal), with the Jet 354170/JDP-20MF rounding things out as the most expensive but easily most powerful. You can’t go wrong with any of the three. The Dremel 220-01 takes the prize here, as you might expect. While researching I found a lot of small drill presses, but frankly, most of them aren’t worth using. The Dremel sits at around the minimum of what I’d say is a viable work tool, while being light enough to still call “small” (while benchtop models are definitely SMALLER than floor models, many still take up quite a bit of space and weigh 50 or more lbs). While the Dremel isn’t what I’d call a powerhouse, it’s not exactly a slouch either. It has quite a bit of power for such a tiny, light package. Something I glossed over before with the Dremel is that it’s a very modular tool. It has a variety of compatible attachments, which I feel makes up for its deficiency in power. While its lightweight nature makes it somewhat undesirable as a drill press alone, it makes it very desirable as a portable “emergency tool” you can lend out to friends or keep in your car (especially since it doubles as tool storage) and have a variety of attachments you cart around to do odd jobs around a large property or for a friend in need. Being able to convert it into a tool sharpener, router, mini saw, and other things on the fly make it a great all-around tool even if it’s not the best drill press specifically. Ironically, while it wouldn’t be my first recommendation to anyone looking specifically for a drill press, of the items on this list the Dremel 220-01 Rotary Work Station IS probably my favorite item on this list and would make it near the top of a list of “Best versatile power tools” in my book. While radial drill presses are interesting, none of them were quite good enough to make it onto the main list. The unique thing about radial drill presses is that the head can be tilted in addition to the table, giving you far more flexibility in the angle you can drill. Unfortunately, in the realm of consumer radial drill presses, they are simply not as good as using a normal drill press and getting a bit creative on the rare occasions a radial drill press may have helped. They tend to have more flex (and therefore less accuracy) and on most occasions serve the same purpose as a normal drill press: drilling straight down (or onto a tilted table). This Shop Fox can serve your needs. This Shop Fox is a ½ horsepower, 5 speed (550 RPM to 3470 RPM) machine with a 9 and ¾ inch circular table. Much like the other Shop Fox drill presses we’ve looked at, its roundtable can tilt up to 90 degrees in either direction in addition to its head being able to tilt 45 degrees clockwise, or 90 degrees counter-clockwise. I won’t lie, this isn’t an impressive machine in raw stats compared to most we’ve looked at. It’s not terrible by any means but is remarkable ONLY for the fact that it’s a radial drill press. For that privilege, it will run you a bit over $300, a little under $100 less than the significantly more powerful Shop Fox W1668 from earlier. I suggest buying this only if you absolutely need the radial functionality (in other words, you regularly work with very awkwardly shaped wood), and suggest purchasing it as a supplement or secondary tool to a better drill press rather than as your main tool. Magnetic Drill Presses are interesting. I didn’t put one on the normal list not out of thinking they are bad (on the contrary, they are usually very good, powerful drills) but because their purpose is so very niche. Magnetic drills (or “mag drills”) are usually used to drill holes in pre-existing metallic structures, like the struts of finished buildings. They are essentially just big electromagnets with a drill attached: clamp it to the surface you want to drill, turn it on, and let it work its magic. It’s not much for finesse, and it’s not exactly lightweight, but it does the job admirably. This is a roughly 48 lb machine…but it kind of has to be if you want it to perform its intended purpose of attaching itself to a steel bar and cutting a large hole (up to 4 inches deep and 2 inches in diameter) in it. It has two speeds, a quick change keyed chuck (1/2 inch bits) and its own attached coolant tank (which can also magnetically attach next to where the drill is, for easy use). I like this thing, but have a hard time recommending it to everyone. It’s a niche tool, and expensive for how often you’re likely to use it (i.e. not very, for most people) at close to $800. If you really need to buy a mag drill for some specialized work though, I wholeheartedly recommend it. It works great for what it is. Here’s where I get the opportunity to talk about some decent drills that just missed the cut. There will be some familiar faces for brands we’ve already talked about (Skil, Wen, and Jet), but we’ll talk about some good options from Delta and Ryobi as well. On the surface, this seems like a great drill press, and at first, was going to be on my top picks for floor model drill presses. Statistically, it seems great. It has the longest stroke we’ve seen so far (6 inches, a full 1 and ¼ inches more than the next runner-up), a ¾ horsepower motor with 16 speeds, a laser crosshair, and a precision depth stop. It has a workstation light, and a 5-year warranty, other nice additions. Unfortunately, what it also has is issues with quality control. Users report many issues with parts breaking down or bending after initial (and fairly gentle) use. All attempts to report them to customer service and make use of that warranty are met with claims that the breakage was due to user error, and therefore not covered. This is bad enough for a relatively cheap machine, but this drill press can run you near to $1400, and I cannot even NEARLY justify suggesting something that expensive when it seems to be a crapshoot as to whether it will properly function or not. Should the manufacturing and quality control issues ever be ironed out, this would shoot to the top of my list for floor models, but until such a point, I cannot conscience recommending this machine to any prospective buyer. Ryobi is actually one of my favorite brands for consumer power tools. Partly because most of their batteries are interchangeable, meaning every time I buy a drill, or a weed whacker, or a portable power saw or what have you I get a new battery I can use in any of them, which is nice. Their products also tend to be pretty high quality in general, and this is no exception. It’s very cheap (less than $150) and has a pretty solid range of speeds (620 RPM to 3100 RPM). It has a nice tilting table (45 degrees either direction as standard), a LED workstation light, and has a good amount of heft (54 lbs). The issue is sort of where it falls in relation to others in the same price, power, and size range. I gave the Dremel a spot in bench top models for its modularity as a tool, and it simply didn’t compete with any other model on the list besides the Dremel, which performs almost as well as a drill press, while serving other purposes as well (and being about a third of the price). If you just want a cheap, good drill press, there are much WORSE picks than this Ryobi model, as it’s still slightly cheaper than the somewhat comparable Wen 4210, but spending the extra $30 or so for better performance is pretty much a no-brainer for me. Sorry, Ryobi. As you might expect from it being on this list three times now, I like this model. It sits in the perfect conjunction of price and performance to me, and if I ever need a floor model this will probably be the one I buy. The other Wen models are exceptional in their own way as well, particularly the 4210 (one of my picks for the best benchtop models), but overall the 4227 blows them out of the water (though that is to be expected; it is Wen’s most expensive model). There’s not much more I can say about this one I have already. It works great, it looks pretty good and has all the extra features you could really want in a drill press. Before I started researching drill presses, I’d never actually heard of Jet before. They make all manner of heavy duty power tools apparently, but manual labor has never really been my thing, as much as I like DIY projects. Now though, I have a healthy respect for Jet, as they have made what is a strong contender for the best product on this list, out of some stiff competition. Their drill presses are largely “no frills”, without fancy LED readouts or automatic digital swapping of speeds (you actually have to manually shift the belts on the interior of this one to raise or lower the speed), but it’s hard to argue with the results: a powerful, sturdy machine that works hard. It might not be fancy, but it’s powerful. Skil is a well-known consumer power tool brand, for good reason. While I rarely think their stuff is the absolute best available, they generally have a great ratio of value to performance that endears them to me. This drill press is no exception: it’s not THE best, but it’s one of them. It has a quite reasonable price for its level of performance, and I wouldn’t hesitate to recommend this to any hobbyist or DIY enthusiast on a budget. It sits in an interesting price range, around the same as the above Ryobi, but unlike that one, I feel it performs well enough on its own to justify not comparing it to the Dremel as its only competition in performance. For here, I want to break down not what I feel are the absolute best in quality, but the best in any given price range. There are a lot of flaws or deficiencies that can be forgiven for a low enough price, and while assuming you have a $1000+ dollar budget is nice for determining what the overall BEST option is, that’s not always the case, and sometimes you need to figure out what the best option for your specific limitations are. As I’ve said before, I love this one primarily because it’s an all-in-one tool. Assuming you have a very small budget, buying something that does JUST one thing isn’t a great idea. Instead, buy a tool that works okay for what you need it to for now, and can be easily converted to smaller purchases whenever you need something new. This is that product: the drill press you can use as a saw, or sharpener, or whatever else you need at the time so you don’t feel so bad about dropping $500 on something you’re only going to use a few times a year. It’s not the best drill press, but it’s the best multi-tool, and it’s not a bad drill press either. For the price (under $50), you can’t do better. Wen is a great brand and has a good drill press for pretty much any price range. The 4210 is very cheap, but can often compete with the big boys in a pinch. Its small size means getting larger jobs done will be awkward or (rarely) impossible but it has the power of some floor models (a max RPM of 3200) even if it lacks the granularity (only having 5 speeds). If you need a dedicated drill press and are willing to spend just a little more for much-increased performance, you can’t go wrong with the Wen 4210. If you have a somewhat higher budget, the 4214 is just all around better than the Wen 4210. It has increased performance in every regard, well worth the $100 increase in price. The laser guide remains one of my favorite features and the lack of which is one of the primary factors that excluded the Skil 3320 or Ryobi ZRDP103L from taking the 4210’s spot. A similar principle applies here; as much as I like the Shop Fox models, all of them lack the laser guide, and to me weren’t worth paying the extra money for the bit of extra power and sanding capability. The Wen 4214 is one of the better benchtop models out there (and what I ended up buying), so I definitely recommend you check it out. That said, if you DO need that little bit of extra power and the improved sanding capability, this Shop Fox is something you shouldn’t overlook. There’s always a use for a good sander, and if you’re willing to overlook the lack of a precision guide, it’s hard to argue with the power and performance of this model. If you have around $400 to drop on a drill press, you could do a lot worse than this. Did you really expect anything else? While there are better drill presses out there, there aren’t really any so MUCH better than they fully outweigh the $300 to $400 price difference between them. If I’d had space (and the need for a larger machine) I definitely would have bought this over the Wen 4214. It’s hard to recommend this one enough. It’s an excellent drill press, with every feature you could want besides very niche functions like a radial head. If you have the money to spend and don’t need a big industrial machine – or aren’t working mostly with metal; this one REALLY shines on wood even though it does pretty good with metal – I can’t recommend this enough. It’s big, heavy, and takes up a bit of space, but the same could be said of all floor models. As long as you don’t feel too cramped with it, it’s hard to do better. My overall pick for the best drill press is, as you might expect, the Wen 4227. For specific purposes like heavy metalworking I’d suggest the Jet 354170/JDP-20MF, or if you need a modular tool DEFINITELY get the Dremel 220-01, but for the intersection of price and function, Wen is overall the best brand for drill presses, and the 4227 is the best Wen brand drill press. All of the drill presses on this list have their own uses to recommend them (particularly Shop Fox’s sanding capability and of course the Dremel) but it’s hard to do better than any of the Wen models on this list for any given price range, as their performance exceeds expectations in most regards, and any deficiencies can be forgiven by their being much, much cheaper than similarly powerful competition that edges them out in a few categories. Unless you need maximum power (which is the Jet 354170/JDP-20MF) and the cost isn’t an issue, the Wen 4227 handily beats all its competition.